Created on Nov. 24, 2012, 5:07 p.m. by Hevok & updated by Hevok on May 2, 2013, 4:57 p.m. The vacuole becomes less acidic relatively early in a cell's lifespan. The drop in acidity hinders the vacuole’s ability to store certain nutrients which disrupts mitochondria energy source, causing them to break down. Preventing the drop in vacuole acidity preserves the mitochondria's function and shape and extends the lifespan . Vacoules are the yeast counterparts of mammalian lysosomes which have the function to degrade macromolecules like proteins and store molecular building blocks. To perform this activity the vacuole/lysosome interioir needs to be highly acedic. Mitochondria the power plants of the cell are normally beautiful, long tubules. The mitochondrial structure and function exhibits alterations with age . As cells get older the mitochondria become fragmented and chunky. Mitochondrial dysfunction in replicatively aged cells arises from altered vacuolar pH. Vacuolar acidity declines during the early asymmetric cell divisions. Preventing the decline in vacuolar acidity suppresses mitochondrial dysfunction and extends lifespan. Changes in vacuolar pH reduces the pH-dependent amino acid storage in the vacuolar lumen. The drop in vacuolar pH hinders the vacuole's ability to store certain nutrients which in turn disrupts the mitochondria's energy source causing them to break down. DR promotes lifespan extension at least in part by increasing vacuolar acidity via conserved nutrient-sensing pathways . Age-induced mitochondrial dysfunction includes increased fragmentation, levels of ROS and loss of DNA in their progeny [17173038; 17173038; 21726403; 19563757]. Mitochondria which are normally tubular, fragment and ultimately aggregate in aged cells. Mitochondrial fragmentation is present early in the aging process and progresses to large aggregates and small fragments that persists throughout aging. Mitochondrial function also declines in aging cells. Mitochondrial membrane potential (ΔΨ) declines (already by 7 divisions). At 18 division the ΔΨ is even lower and remains low thereafter (100% fo cells by 28 divisions). ΔΨ-dependent import of the mitochondrial matrix protein Cox4 is reduced in aged cells. Mitochondrial structure and functions are progressively altered during the aging process. Vacuolar acidity declines progressively. Reduced vacuolar acidity in mother cells leads to subsequent development of mitochondrial dysfunction during approximately the first four cell divisions and then remain low for at least 18 divisions. Yeast cells lacking V-ATPase activity have drastically shortened lifespan . Reduced vacuolar acidity in aged cells cause mitochondrial dysfunction by preventing adequate import of neutral amino acids through the vacuolar transporter Avt1. Acidity of the vacuole is decreased as newborn cells become aged mother cells. Acidic vacuoles are regenerated in newborn daughter cells. Although vacuolar acidity is reduced in mother cells, high acidity is restored in newborn cells, even in daughters of old mothers. This restoration requires V-ATPase activity as it is eliminated in vma2 cells, which lack V-ATPase activity and have constitutively reduced vacuolar acidity. DR (0.5% glucose, 0.05% glucose and 3% glycerol) extends the replicative lifespan [11000115; 15328540] at least in part by boosting vacuolar acidity. Inhibiting PKA, Sch9 or TOR by lifespan-extending mutations gpa2, sch9 or tor1 prevents the decline in vacuolar acidity and development of mitochondrial dysfunction in aging cells . Aging yeast cell exhibit the same genomic instability present in human cancer cells and mitochondrial dysfunction causes that instability [http://www.biocompare.com/Life-Science-News/125766-Researchers-Define-Key-Events-Early-In-The-Process-Of-Cellular-Aging/]. Seo, A. Y. et al. 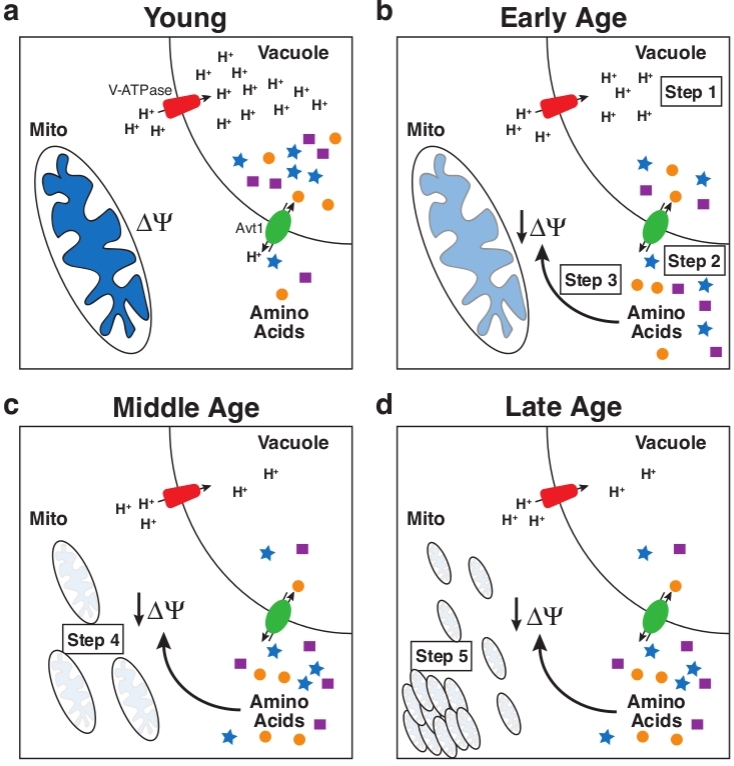 New insights into the role of mitochondria in aging: mitochondrial dynamics and more. J. Cell Sci. 123, 2533–2542 (2010). Scheckhuber, C. Q. et al. Reducing mitochondrial fission results in increased life span and fitness of two fungal ageing models. Nature Cell Biol. 9, 99–105 (2007). 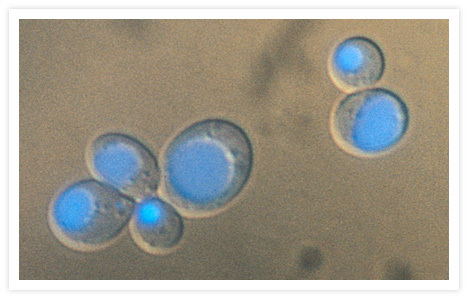 Lam, Y. T., Aung-Htut, M. T., Lim, Y. L., Yang, H. & Dawes, I. W. Changes in reactive oxygen species begin early during replicative aging of Saccharomyces cerevisiae cells. Free Radic. Biol. Med. 50, 963–970 (2011). McFaline-Figueroa, J. R. et al. Mitochondrial quality control during inheritance is associated with lifespan and mother–daughter age asymmetry in budding yeast. Aging Cell 10, 885–895 (2011). Veatch, J. R., McMurray, M. A., Nelson, Z. W. & Gottschling, D. E. Mitochondrial dysfunction leads to nuclear genome instability via an iron-sulfur cluster defect. Cell 137, 1247–1258 (2009). Bishop, N. A. & Guarente, L. Genetic links between diet and lifespan: shared mechanisms from yeast to humans. Nature Rev. Genet. 8, 835–844 (2007). Hirata, R. et al. Molecular structure of a gene, VMA1, encoding the catalytic subunit of H1-translocating adenosine triphosphatase from vacuolar membranes of Saccharomyces cerevisiae. J. Biol. Chem. 265, 6726–6733 (1990). Jackson, D. D. & Stevens, T. H. VMA12 encodes a yeast endoplasmic reticulum protein required for vacuolar H1-ATPase assembly. J. Biol. Chem. 272, 25928–25934 (1997). Kaeberlein, M. et al. Regulation of yeast replicative life span by TOR and Sch9 in response to nutrients. Science 310, 1193–1196 (2005). Kaeberlein, M., Kirkland, K. T., Fields, S. & Kennedy, B. K. Sir2-independent life span extension by calorie restriction in yeast. PLoS Biol. 2, e296 (2004).